A free technology I found is called Wordnik. I had a lot of fun with this website because you type in any word and it comes up with so many different categories. It will give the many definitions, examples to use the word in a sentence, the etymology, related words, and even more lists that involve the specific word. As an English/Language Arts geek, I could spend all day typing in different words and reading all the information it provides. There are lists at the bottom of the page too that are something in relation to the word or random facts about words. For example, when I searched for a word, I scrolled to the bottom and found a title that said “Words heard too often in songs”. I thought this website was a lot of fun and I could easily use it in my English classes. Students can benefit from the site by finding synonyms, antonyms, equivalents, and so on. Students can also find different ways to use the word in many contexts. It’s a great way to build vocabulary for children and get them interested in the many factors involved with the English vocabulary. In relation to Bloom’s Taxonomy, this free technology speaks to the Knowledge/Cognitive category of finding definitions and information. 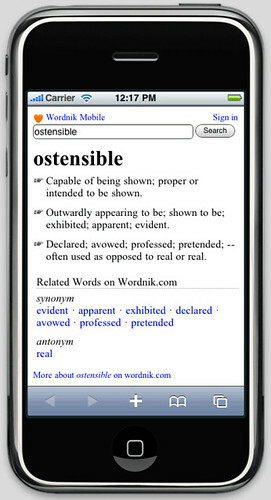 I also liked that there is a Wordnik mobile for anyone that may need to search for a word while reading or any other time a computer or dictionary may not be available. There are also tabs at the top of the page that will direct one to a word of the day, a random word, and you can connect with others via the community tab. This entry was posted in Uncategorized and tagged EDFI560SM1209. Bookmark the permalink.